"WELCOME TO San Francisco," Eddie Izzard greeted Wednes day night's packed house at the Curran Theatre. No, it didn't make any sense. He's the one who'd just arrived. The audience roared its approval. It had been roaring ever since the houselights dimmed and spotlights combed the house, long before the English comic strode onto the stage. Izzard inspires that kind of enthusiasm. What's more, he earns it. He's fast -- oh, so very fast. He's flip, hip and -- there's no other word for it -- cheeky. He's wildly eclectic, casually surreal, astonishingly penetrating and so relentlessly funny that you scarcely notice he's been talking for two hours (with no intermission) until he brings his show "Circle" to its close. He's a one-man Monty Python troupe unfettered by BBC language or subject restrictions and unleashed upon the world. "Bombastic, aren't I?" he remarks after a rant on the evils of Augusto Pinochet, Margaret Thatcher and Mad Cow Disease, in one of the quick asides that make up almost as much of his text as his main narrative. If this is bombast, Lenny Bruce (whom Izzard played onstage in London last year) was a pedant. Izzard, for those who came in late, achieved fame a few years back as the bloke in a dress -- the English transvestite stand-up comic whose last show, "Dress to Kill," was partly about his preference for female clothes and female lovers (and partly about Stonehenge, Hitler, Catholicism and many other things). "Dress," a long-running hit in London and New York, played the little Cable Car Theatre here in '98 and was filmed for an HBO special upstairs at the larger Stage Door. "Circle" opened last fall in England and has been touring Canada and the U.S. since February, produced by New York's Westbeth Theatre Center. It's only here for a short run -- just through Saturday -- though at the much larger Curran, in between equally short gigs in Seattle and L.A. on the way to New York. The attitude is the same, but the material is all new and so, to a certain extent, is Izzard's appearance. He still sports the bright red lipstick, nail polish (silver this time) and heavy mascara beneath a shock of spiky blond hair. But Izzard is performing in a relatively sedate black shirt and trousers (with glittering seams) above his gleaming high-heeled boots. As short a time as he's spending here, he seems to know this town as well as it loves him. His opening quips about the fog and about Oakland demonstrate more than a passing familiarity. As did his: "You may not know what's happening in Eastern Europe -- or in Western Europe. Or anywhere outside San Francisco." If we don't, Izzard is here to shake us out of our provincialism. "Circle," he's said in interviews, is meant to encompass cosmic subjects from the orbits of planets and galaxies to, yes, the great circle of life. 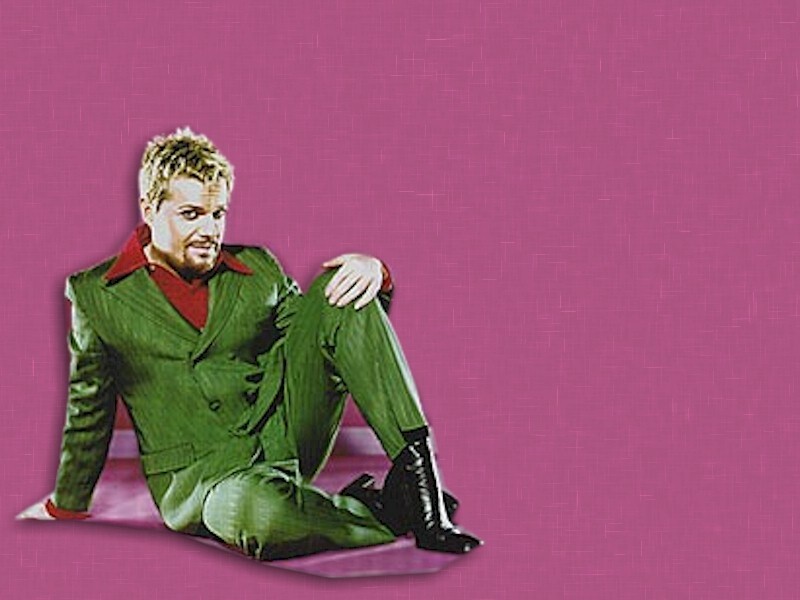 But, though Izzard is astonishing in his ability to keep returning to his main theme after one digression on top of another, "Circle" is both less cohesive and more far-ranging in its topics. He starts with a few irreverent observations about "Pope Johnny Paul II" -- which somehow spark asides about Cherokees, swimming the English Channel, "Baywatch" and styles of soap opera acting -- leading into a critique of the limits of recent papal apologies for the church's past sins ("He apologized for the Spanish Inquisition. Said it was far too inquisitive. It was supposed to be the Spanish casual chat"). The next thing you know, Izzard is off on two tangents at once, bobbing back and forth between a Pythonesque lampoon of the Crusades and a devastatingly hilarious take on Charlton Heston ("This is an impression of Charlton Heston with no time spent on practicing") that involves ruminations on a monkey handling a handgun (with a detour through chimps and sign language) and an NRA member who "got shot trying to protect his guns." From there, Izzard is back to religion, his primary theme: "God created Adam in his own image, but 65 million years before that he created dinosaurs in the image of his Uncle Ted." The ensuing scene of God sending Jesus to preach to a piano bar full of saurians is a sidesplitting classic. But then so are his routines about Darth Vader trying to get lunch in the Death Star canteen, a drug-friendly Olympics full of stoned hurdles runners and pole vaulters, Hollywood World War II films, mad cows and whale songs ("the deejays of the sea"), speeding up a whale's call so we can hear that he's actually singing "It's not unusual to be loved by you." Pacing the stage in his high heels in front of a luxuriant projected rose, Izzard is a mind in constant motion -- digressing from his digressions, arguing with himself, playing several characters at once, stopping continually to make mental notes on jokes that didn't work and critiquing the style of an obnoxious heckler in the opening night audience. "So -- uh -- that's all true," he says in the brief moments he takes to collect his thoughts before launching on another tangent. It isn't really. Part of the delight of Izzard's act is the way he blends facts, ideas and misinformation in his flights of fancy. That and his no-holds-barred attitude toward right-wing icons, religiosity and sacred cows of every kind. Two hours is a long time to sit and listen to anyone, but with Eddie Izzard it's scarcely enough.